Sweet corn is a favorite crop in many home gardens. It's also a very fast-growing crop, with many varieties of sweet corn ready to harvest in as little as 60 to 90 days. Sweet corn is regarded as a warm-weather crop since it requires a temperature range of between 60 and 80 degrees F for optimum development. In Ohio, growing sweet corn in the home garden can be both fun and easy, thanks to Ohio's warm summer temperatures and fertile soil. It does, however, require some preparation, mainly making sure that the soil is the right temperature at planting time. Choose a planting location for the sweet corn that will provide maximum sunshine. For success in growing sweet corn in Ohio, at planting time soil temperature at a depth of between 4 and 6 inches needs to be at least 50 degrees F, according to Ohio State University. Prepare the planting area one to two weeks prior to your planting date. A well-prepared seedbed can help with the germination of sweet corn and its development. Dig up the soil and turn it over to a depth of between 10 and 12 inches using a spade, a garden fork or a rototiller. Eliminate all objects, such as rocks or weeds, from the planting area, since they can interfere with the germination and growth of the sweet corn. Broadcast a granular 12-12-12 or 6-24-24 fertilizer into the planting area at the rate of 1 to 2 pounds for every 100 square feet of cultivated area. Then, irrigate the area thoroughly using a heavy mist of water to help dissolve the fertilizer into the soil. Amend the soil in the planting area if the soil is sticky or clay-like, such as in the regions around Columbus and Central Ohio. You can use aged manure, dehydrated compost or any other similar type media. Mix the amendment into the soil thoroughly using a garden fork or rototiller. Create 1-inch-deep rows that are 10 to 12 inches wide in the planting area. Each row should be spaced at approximately 30 to 36 inches apart. For optimum pollination, create several short rows rather than one long row. Then, plant one sweet corn seed every 8 to 12 inches and cover each seed with approximately 1 inch of soil. Pack the soil down over the sweet corn seeds gently. Water the rows of sweet corn seeds using a semi-fine mist of water so you will not displace the seeds. Refrain from watering again until the sweet corn seeds sprout, usually within seven to 14 days, depending on conditions. Water the sweet corn as often as needed. 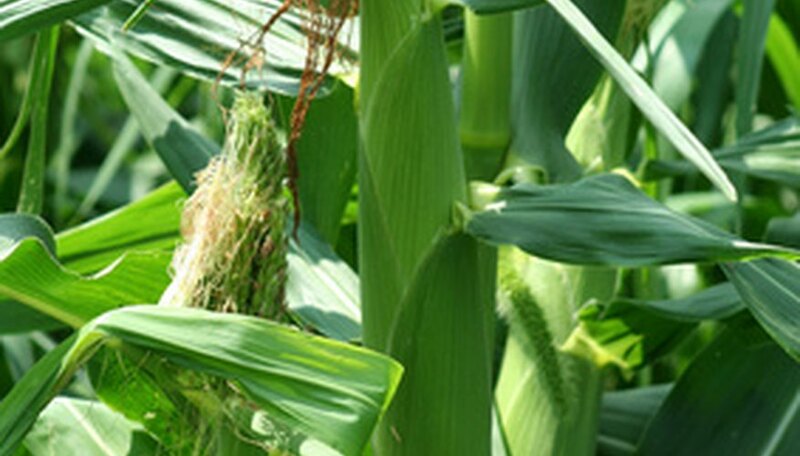 Moisture levels during the latter stages of sweet corn development are crucial. To determine if there is enough moisture in the soil, wad up soil in your hand. Soil that clumps up when squeezed contains adequate moisture; soil that crumbles and breaks apart when squeezed requires moisture, according to Ohio State University.